The mod-page for the new project East Factory is up! Will it be a continuation of Disponentia? Check out my future plans here! Disponentia v1.1, a fully isolated conversion custom story for Amnesia - The Dark Descent. A new fixed version of Disponentia with no graphical issues. 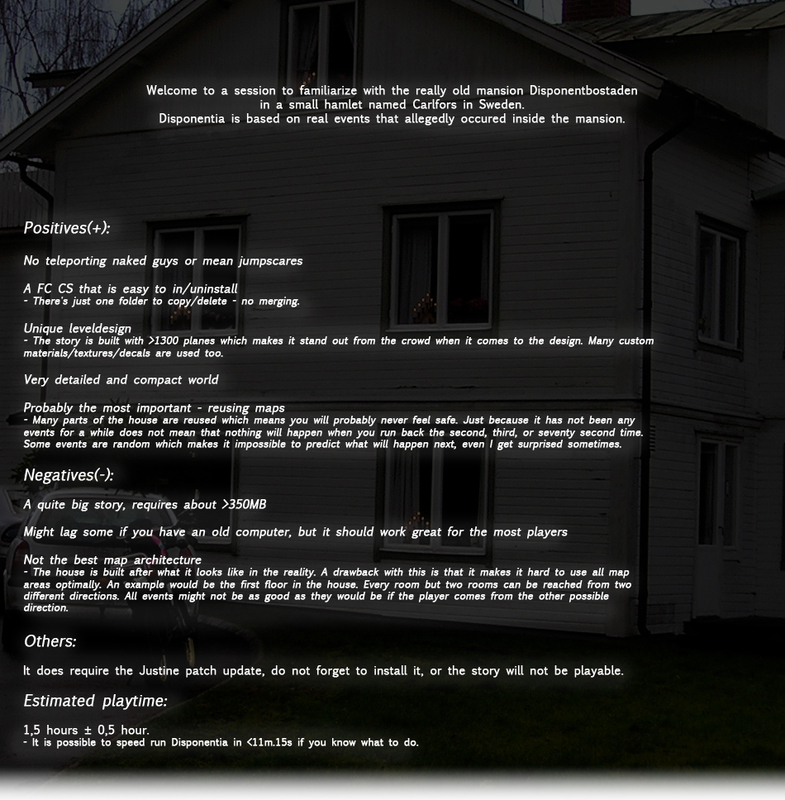 Disponentia v1.0, a fully isolated conversion custom story for Amnesia - The Dark Descent. Ok guys, having some issues here. Disponentia, and along with some other Justine required mods wont load for me at all. I bought AMNESIA TDD from Steam, and the Frictional website tells me that i dont need to install Justine if i had purchased it from a site such as Steam. But my guess is that since i dont see the justine patch anywhere on my menu's that it is not installed. HELP, what do i do??? To launch Justine double click Amnesia in Steam, then instead of selecting Play select 'run settings launcher', in the bottom right of the box that appears there should be a button for Justine. If this button isnt there then yes you may have some issue with your installation. Hey im getting an error that wont let me launch the .bat at all.. it is saying "Application load error 5:0000065434" this has happened before and im not sure what is going on.. and it seems no one else has had this issue ? I would get it, but my Internet is so slow just downloading one small mod took an hour. I'll try it if I get the chance. The game crashed for me and my friend when trying to go into the basement. FATAL ERROR: Could not load world file 'maps/main/maps/main/03_archives.map'. Finally finished it. It's damn good mod, something really different from the other FC mods. Good work man, lots of new things and couple unique scares. Really creepy atmosphere and overall terrifying experience to play seriously everyone should try it!